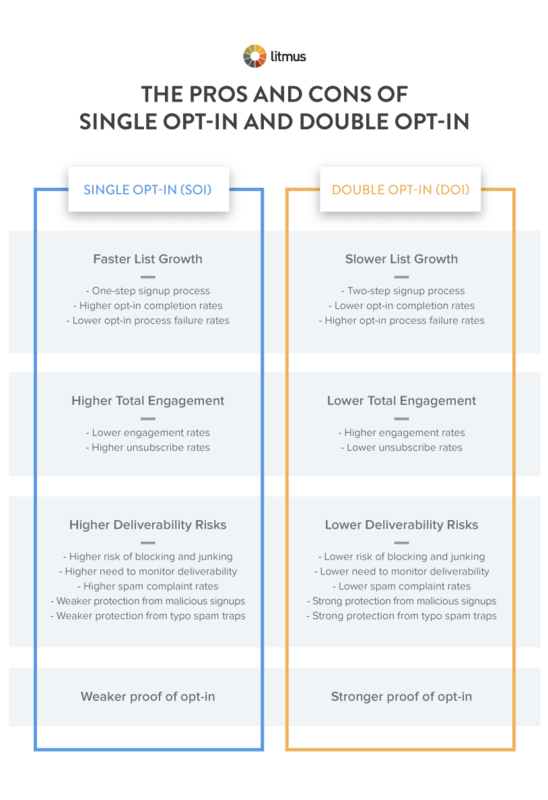 We’ve heard the case for single opt-in (SOI) and the case for double opt-in (DOI). And we have also heard public opinion on the matter, which is nearly evenly split. Before we proceed, let’s quickly review the key points that have been made about SOI and DOI. Now let’s summarize the benefits and risks associated with each of these methods. The debate boils down to the tradeoff between list growth and deliverability risks. 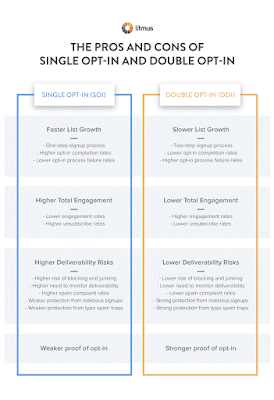 Single opt-in maximizes list growth in exchange for taking on higher deliverability risks, while double opt-in minimizes deliverability risks in exchange for slower list growth. 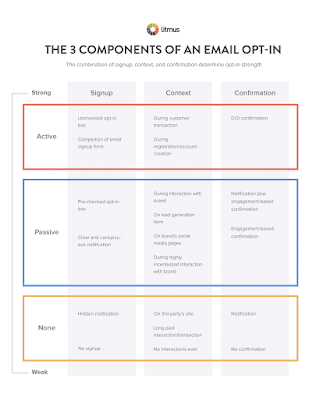 There’s more nuance to it than that, as you can see in this chart, but those are the principal issues at stake for email marketers. 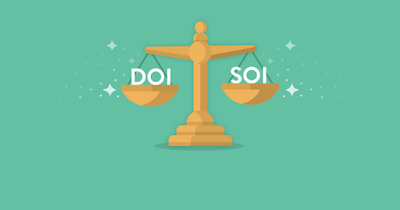 It’s probably also worth noting that the risks around executing poorly on SOI and executing poorly on DOI are quite different. When you do double opt-in poorly, your confirmation rate is lower, so your list growth suffers even more. When you do single opt-in poorly, your spam complaints are higher and your engagement rates are lower, so your deliverability suffers. Your industry requires stronger permission because of regulations concerning marketing to minors, healthcare or financial information, etc. If any one of those describes your company, then single opt-in isn’t a safe or viable option for your circumstances. Context: Under what circumstances did the person signup? Was the signup during an active customer transaction? Did the email address owner share their email address in a more passive setting where the goal was primarily to receive other information? Confirmation: How is the sender confirming that the email address owner willingly and knowingly signed up to receive promotional emails? Did the sender ask the email address owner to actively confirm their opt-in via an email sent to that address? Is the sender monitoring new subscriber engagement as a passive method of verification? Does the sender send a welcome email to new subscribers? There’s a range of possibilities for each of these three components, as you can see in the chart below, which categorizes those three components by whether they’re active, passive, or non-existent. Just using the examples listed in our chart, we count 270 different permutations of opt-in components—resulting in 54 shades of double opt-in and 216 shades of single opt-in. And third, many brands won’t use single opt-in or double opt-in exclusively; they’ll use a mix of both across their various touchpoints. While some brands may find that SOI or DOI works for them across the board, others will want to find the best permission practice for each of their email address acquisition sources, whether it’s the email signup form on their website, Facebook page, or in-store kiosk. We recommend starting with the context, then looking at the possible signup methods, and then balancing those with the appropriate confirmation method. 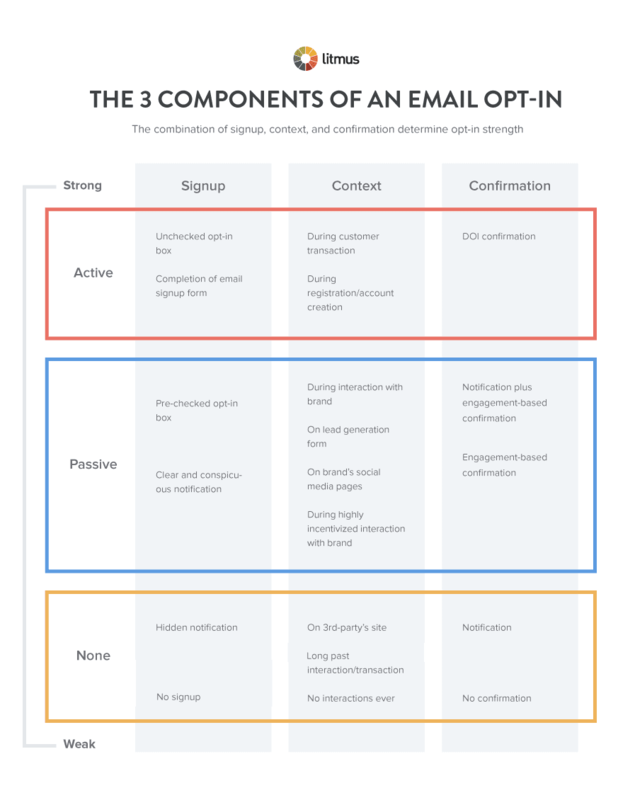 For instance, if during a customer checkout (active context) you used an unchecked opt-in box (active signup), then using a double opt-in confirmation (active confirmation) adds an extra step and friction that offers very little protection that isn’t already provided by the context and signup. On the other hand, if you’re running a sweepstakes (passive context) and using a pre-checked opt-in box (passive signup), then a double opt-in confirmation would provide significant added protection. Given all the combinations, plus the fact that every brand and audience is different, we highly recommend that marketers experiment. In addition, whether you’re actively testing your email permission practices or not, we recommend that you track the performance of each of your email address acquisition sources on a rolling or periodic basis. Often, a brand’s deliverability problems can be traced back to a single email acquisition source. If you have visibility into acquisition source performance, you can fix problems by adjusting the signup or confirmation method. If you don’t have visibility, then deliverability problems become mystical and bewildering (and expensive). We hope these opinions help you make sound decisions regarding the email permission practices you use across your customer touchpoints.